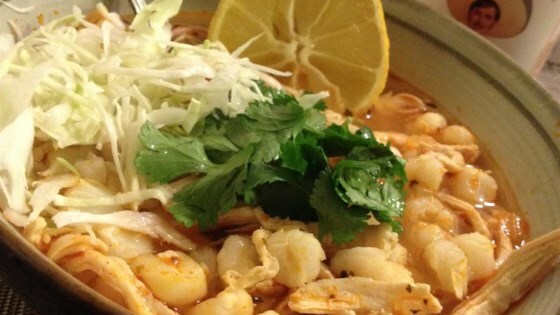 "This easy-to-make chicken and hominy soup is one of many great Mexican Christmas traditions, or simply delicious whenever you want to eat something warm and comforting. It's garnished with thinly sliced radishes, shredded lettuce, finely chopped onion, chopped cilantro, and lime wedges, which diners add to the soup as they please." Heat remaining 2 tablespoons canola oil in the same skillet over medium-high heat. Cook and stir onion and garlic until soft and transparent, about 5 minutes. Return shredded chicken to the skillet. Stir in the chicken broth, water, oregano, salt, and chili powder. Reduce heat to low, cover, and cook about 90 minutes. Stir in the hominy and cook until tender, about 15 minutes more. Taste to adjust seasonings, adding more salt and chili powder, if desired. Serve in soup bowls with1 tostada shell per serving. Garnish as desired.